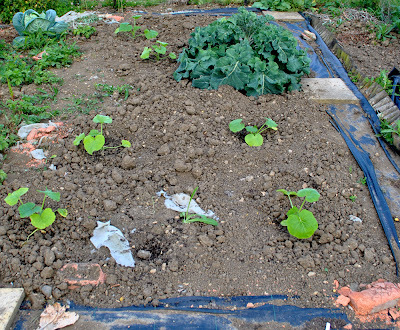 We managed to spend about four hours up at the allotment on Saturday in the sun which was lovely. Most of that time was spent weeding and tidying which meant a lot of the more jobby jobs didn't really get done. Despite that it was time well spent as the plot needed a bit of love after all the fruit cage related excitement of the last couple of weeks. We did get a couple of things done worth reporting however. 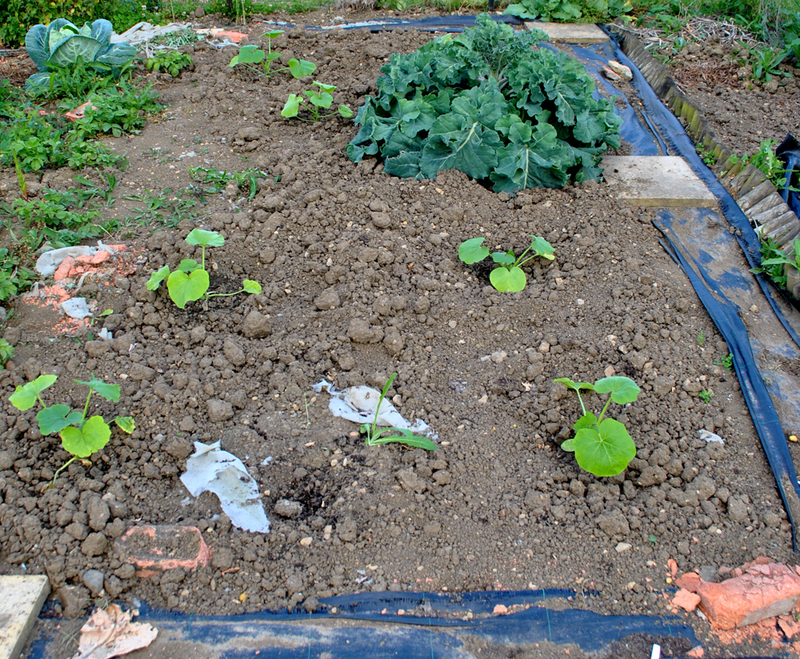 This year’s squash plants made it into their final homes. Most went into half of the spring brassica bed now that it'd mostly clear and the last couple went in with the sweetcorn in a kind of experimental Two Sisters approach (there's a traditional companion planting system called Three Sisters that involves planting squash, beans and sweetcorn together). Hopefully the sprawling nature of the squash plants will help keep the weeds down around the base of the sweetcorn. 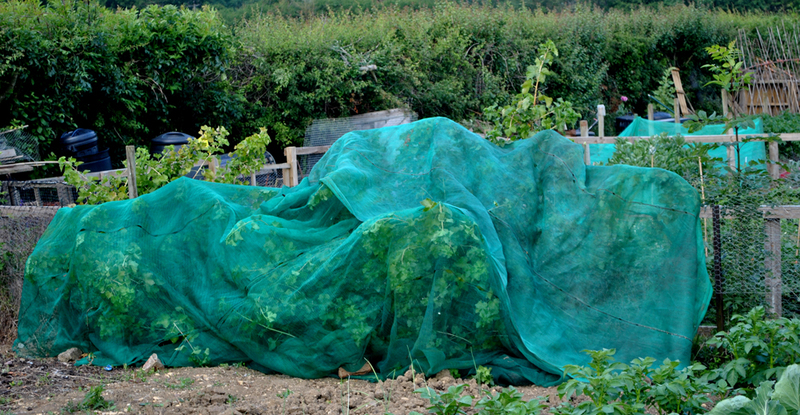 We also made an attempt to save this year’s gooseberry harvest. When we took over the plot there were a couple of small gooseberry bushes along one of the sides. They didn't fruit the first year but since then they've grown huge despite our neglect. The problem is, since they started producing, we've lost each harvest to the birds who seem amazingly adept at stripping the bushes the nano-second the fruit turns ripe. 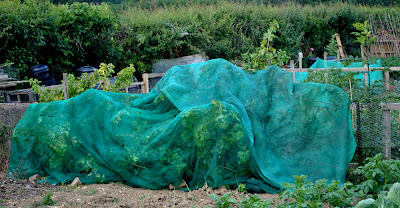 So, this year, now the fruit is starting to turn red (they seem to both be red gooseberries which is a nice change) we thought we'd take some of the netting we'd removed from the old fruit tunnel and try and cover the bushes up as best we can in the hope it'll deter the birds. It looks a bit makeshift, and we left the branches that were growing our the other side of the fence or the birds to have, but it should do the job. We hope. Saturday afternoon we happened to be driving past the Gloucester branch of Focus which was holding a closing down sale so we popped in. It felt a little vulture like to be picking over the bones of a business gone into administration like this but we did find a couple of things to bring home with us. 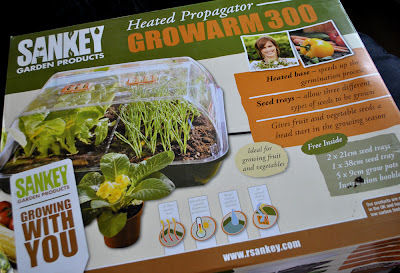 Most interesting was this nice big heated propagator. I've wanted one of these for the last couple of years to enable me to start off chillies and peppers etc mega early so it’s nice to have one at last and it'll mean the seed sowing bug can take hold even earlier next year. We also found a sorry looking whitecurrant bush that looked like it hadn't been watered for a week and was on its last legs. Taking pity on it we bought it and took it straight up to the allotment and planted it out in the fruit cage. Popping up there tonight on the way home it seems to be settling in well and looks a million times healthier already. I'm not really sure what you do with whitecurrants but it’s nice to save something that was pretty much destined for the rubbish heap. 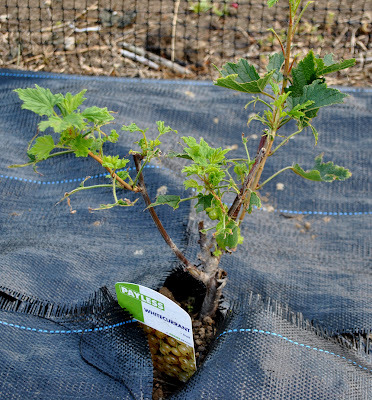 I bet that white currant bush becomes a well loved pet. Well done with the heated propagator. I remember looking for one myself back at the start of the season and being amazed how expensive they were at full price and thinking to myself that I just couldn't justify spending that sort of money at that time. However I think like you, I would snap one up if I saw one reduced as they would have given so much stuff an earlier start. What squash was it you planted? We are trying some Butternut and hundredweight pumpkins. We haven't grown any squash before so looking forward to harvesting them instead of buying them. Things are looking good. Good luck with the gooseberries and congratulations on the propagator! We have whitecurrants and use the raw in fruit salads. They can be used in the same way as redcurrants. WE have used the three sisters method in the past. 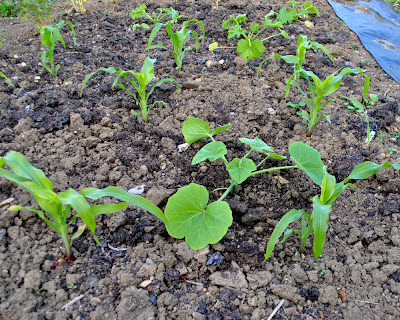 Our sweetcorn varieties aren't strong enough to support the runner beans which we grew up canes but the squash were perfectly happy crawling about under the sweetcorn. Congrats on your bargain hunting! its lovely to rescue unloved plants and make them productive. I've adopted the "two sisters" method as well, my sweetcorn and beans didn't time well so i've just gone for sweetcorn and courgettes/squash. It's working really well and the plants in that bed are the healthiest we have! Next time I'll be more organised and try the beans as well! I didn't use my heated propagator nearly as much this year as I have done in the past as the weather was warmer so much earlier this year. Many things which I usually start off in the propagator was started off in the greenhouse without any heat. You can't guarantee that every year though so it's good that you spotted a bargain. Your fruit cage is filling up already. @ Sarah - We've got four types this year, Butternut (of course), Winter Festival, Sunshine (I think that's what it's called) and Hooligan (tiny tiny orange ones). SNAP!! I've just done a 'two sisters' , but mine's with beans and courgettes. We've still got loads of sweetcorn left in the freezer from last year so it seemed silly to plant it again just for the sake of it. Loving your Blog at the moment.